The Story of radon goes back as far as the last ice age. Several Million years ago glaciers covered most of the land we call home today. Contained within these ice blocks were several minerals, elements and isotopes. One of these isotopes was Radium-238. Over time, Uranium-238 decomposes and emits a by-product commonly known as radon gas. 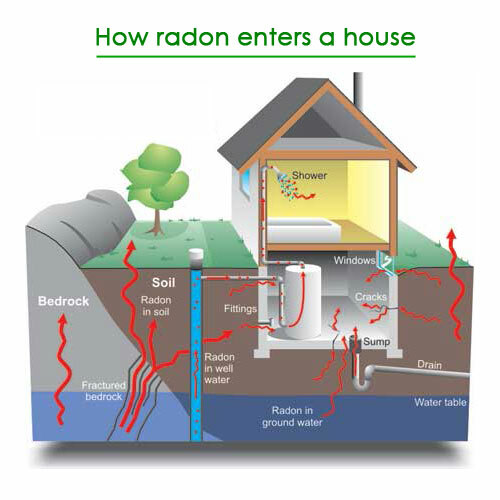 Radon is colorless, odorless, and tasteless gas that is found in the soil under our homes. As this gas is emitted and travels to the surface it enters our homes through areas of ground contact. It can enter through small cracks in the basement, crawl spaces and slab on grade surfaces of the home. Sump pumps are an additional easy entry point for radon gas. Even if you don’t have any visible cracks in your foundation it is very possible you could still have high radon levels. This is because a radon atom is much smaller than a concrete atom and radon can and will permeate concrete. Do I Need Radon Testing? Long term exposure to Radon carries a serious health risk. When we breathe this gas into our lungs over time, the radiation contained within the radon atom can cause cancer cells to form in the lung tissue. Radon is the leading cause of lung cancer among non-smokers in the United States. Long term exposure to elevated levels of radon increases the risks of developing radon induced lung cancer. According to the American Lung Association 22,000 people a year die of radon induced lung cancer and this is a totally preventable Statistic! Get a radon test for your home and office and control your radon exposure today! Call TODAY or Contact Us to schedule your radon test or mitigation!